Sam graduated from Princeton University in 2010 where he played lacrosse and majored in Economics. After a brief stint in finance in New York City, he attended Navy Officer Candidate School in Newport, RI and commissioned as an Intelligence Officer. He deployed to Europe and the Middle East aboard the USS George H W Bush and is currently stationed at the Office of Naval Intelligence in Washington, DC. 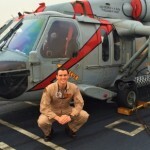 Sam plans to separate from the Navy in July 2016 in order to pursue an MBA.